Reverend Mary Beth Ellis was ordained through Pathways of Light as a Course in Miracles licensed minister and counselor. She is a Christian Buddhist who has explored many spiritual paths in depth, including Hinduism, the Fourth Way (Gurdjieff) and the Sufi tradition. Reverend Ellis has taught Eastern philosophy for many years at a local private prep school. She feels that all paths lead to the oneness of all life and The Source. That Source may be called God, the Divine, Christ Consciousness, Brahman, or the Way. She believes that the point of life is to become one with this Source and to manifest the Eternal Principles in our daily lives in order to "have life and have it more abundantly." Reverend Ellis also has a Masters degree in French and has been a high school teacher of French literature and conversation for many years. She was recently knighted by the French government for her world-wide contributions to French culture, including teaching French in Dharamsala, India, home of the Dalai Lama in 2013. Her philisophy is that we may temporarily be manifesting like a drop of water that is finite, but that ultimately we are more like the ocean, infinite and never changing. We are eternal, divine, and capable of infinite peace, joy, love and abundance, if we align ourselves with the Eternal Laws and the Christ Consciousness within. Unity membership is unique. There are no requirements other than to know God and to understand, love, and obey the Eternal Laws of the universe. It is not necessary to discontinue membership in any other organization to become a Unity member. Unity leaves the member wholly free to live his or her life according to the inspiration and guidance of the Spirit of Truth within each individual. There are no rules. There are no dues. Unity members study, work, and pray together to help one another. Thus, they become a force for good in the world. God is absolute Good, everywhere present and the only Presence and Power in the Universe. All beings are divine; the Christ spirit is in all of us. Our very essence is of God, and therefore we are inherently good. Humans creates their own experience by the activity of their thinking. Everything in the manifest realm has its beginning in thought. Mind is the connecting link between God and man. Meditation, prayer, and silence make this contact with Divine Mind possible. “Peace, be still and know that I am God.” The spirit within will heal us as we make contact with Divine Mind. God is the healing power within man. There is no such thing as hell. Heaven and hell are states of mind. The body dies, but the soul lives on eternally. Christ refers to the divinity in every person. Unity’s stated goal is to support its members in finding the fullness of the Christ in themselves and in their world. Unity seeks diversity and has a strict policy of nondiscrimination based on race, color, gender, age, creed, religion, nationality, ethnicity, physical disability, or sexual orientation. In 1889, an American couple in Kansas City, Missouri, Charles and Myrtle Fillmore, sought health by changing their ideas about God and themselves. They began publishing a little magazine and praying with people who subscribed to the magazine, and they began teaching classes. Their ideas became a movement; the movement became Unity. In the early 1900’s, Unity was introduced in New Orleans by Mrs. Lillian White as a study class in her home. The purpose of the class was to study and apply to daily living the Christian principles as presented by Unity School of Practical Christianity of Kansas City, Missouri. Included in this course of study was the interpretation of the Scriptures from a metaphysical point of view and the explanation of the action of the mind—as the connecting link between God and man. The effect of the mind on the body was also studied. In 1927, a member of the study class passed on and left the group $500.00. In order to receive this legacy it was necessary for the group to incorporate under the laws of Louisiana. The group did so, adopting the name of New Orleans Unity Society of Practical Christianity. The study group soon outgrew Mrs. White’s home and with the $500.00 rented the 5th floor over the Rapp’s Trunk Store at 604 Canal Street, where the congregation remained until 1948. When Mrs. White became ill, the group wrote to the Kansas City Unity Headquarters seeking a minister. The Reverend Ruth Childress Murphy was sent to minister to the New Orleans Unity Society. Ruth Childress was born in New Orleans on March 31, 1890. She was a graduate of Sophie Wright High School and Soule Business College. Upon graduation she briefly worked with a local bank. Shortly after, she was employed by Southern Railroad and eventually by GM&B Railroad. In 1938, in the aftermath of the Great Depression, Ruth Childress Murphy was talking with a fellow employee about financial concerns, and the co-worker gave her a copy of The Daily Word, the monthly publication founded by the Fillmores. At the end of the month she asked her friend for another copy, because the little book helped her spiritually. Her friend suggested, instead, that she visit the Unity Center over the Rapp Trunk Store. Being raised a Catholic, she knew that she was forbidden to seek help from another religion. She reasoned that, since Unity was not another religion, and after deliberate and concerned hesitation, she finally took the elevator up to the Unity Center. From that moment forward she was a Unity student. Each day, the Unity Center conducted a noontime prayer service consisting of meditation and affirmative prayer. Every day Ruth hurriedly ate her lunch so that she would be sure to arrive in time for the Unity Center Service. On most occasions, all she had for the offering was the nickel she usually spent for a coke at lunch or her car fare home, but her soul was so starved for spiritual food and guidance that she gladly gave what little she had. During this time Ruth was eager to learn more about Unity, and what better place than in Kansas City, the world headquarters of the movement. Taking advantage of the free pass that railroads provided employees, she fulfilled her desire. In 1945, with her family life changing and her boss transferred, Ruth decided to resign her position with the railroad and work at Unity headquarters in Kansas City. 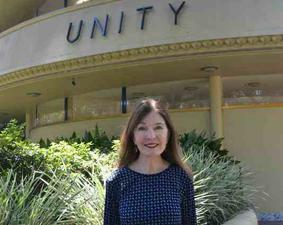 She first worked in the file department, and when Unity moved to Unity Farms (now known as Unity Village), she was transferred to Silent Unity, the special prayer unit that is an integral and important part of Unity. Later she worked in the telephone department of Silent Unity, moving to the summer Teacher’s Class with Dr. Leroy Dale. On October 15, 1947, Reverend Ruth Murphy was assigned the ministry of the New Orleans Unity Center. Rev. Murphy recalled that when she returned in 1947 as the first minister of Unity of New Orleans, attendance at services was small but showed signs of growing. By 1948, due to the ever-increasing attendance, the Fire Chief of New Orleans called to her attention the fact that there was only one elevator and no fire escape between the ground and fifth floors. This constituted a safety hazard, and the Fire Marshall gave the group one year to find a new home. In one year the Society raised enough money to purchase a lot on St. Charles Avenue between First and Second Streets (the old Farwell Place) and to hire an architect to draw up plans for the new building. Before the architect’s plans were put to use, a real estate woman showed Rev. Murphy the Breckenridge Mansion at 3722 St. Charles Avenue. Using the newly purchased lot as a down payment, the Mansion became Unity’s new home. In spite of the small congregation, they stepped out on faith and assumed a $50,000 mortgage with a $350.00 monthly payment. In 1950, the group moved into the beautiful mansion, which had belonged to Mr. Preston Breckenridge, President of Whitney Bank. This was to be the Society’s home for the next 10 years. The congregation continued to grow and attracted some wealthy patrons, such as Thurston B Martin, President of First National Life Insurance Company, and his wife Pearl, and Mr. Alfred B Freeman, President of Coca Cola, and his wife Domenica, who joined the Society and gave generously of their time and money in support of Unity. However, the need for a more adequate center to hold the growing membership became more and more obvious. By 1960, the Society decided to borrow again, this time to pay for the demolition of the Breckenridge Mansion and to build a new Unity Temple. While the temple was being built, the congregation met in an office at Commercial Alley. In 1960, the architect Leonard Reese Spangenberg, a student of Frank Lloyd Wright, was told to create “something round” to symbolize “life, eternity, and a circle—without beginning and without end.” To his credit, not a single right angle exists in the edifice located at 3722 St. Charles Ave. The sanctuary is round, as are the plant beds, the catch basins, the skylight, the light fixtures, the staircase, the choir loft, the receptionist’s desk, and even the minister’s pulpit. Spangenberg, a Taliesin West Fellow, paid homage to Frank Lloyd Wright’s Annunciation Greek Orthodox Church in Wauwatosa, Wisconsin and the Solomon R Guggenheim Museum in New York, both also noted for spherical design. The larger dome shelters the sanctuary; the smaller dome is higher and holds the administrative offices. On the outside the domes are striking, as they are a gold-colored butyl (synthetic rubber). Circular skylights that allow natural light to open up the space are located in the eye of each dome. The 10,000 square foot project cost $170,000. In March of 1961, the first service was held at Unity Temple in New Orleans. Thirty-six years later, Reverend Ruth Elmer, Reverend Murphy’s daughter, enthusiastically continued the ministry that her mother started in 1947. Every Sunday there was an 11:00AM service, and every Wednesday there was an 11:00AM healing service—both which continue to this day. When Rev. Murphy suggested that the congregation buy the St. Charles Avenue site, at least one member commented that her eyes were bigger than her pocketbook. At one time, the congregation was five months in arrears in their mortgage payment. On the very day notice was received from the mortgage company that it would foreclose, a couple from Algiers, who were not members of the congregation, offered to lend $5,000.00. The money was paid back in three years, and the Temple never missed another payment. What made this even more remarkable was that the minsters never asked for donations from the podium, so there was no way for the couple to have known of the need. As Rev. Murphy recalled, prayer and faith were the answer. Dr. Murphy took her light into another world in 1999, one month short of turning 101. She was succeeded as the church minister by her daughter, Dr. Ruth Elmer (of the Elmer candy company family), who served as the sole minister until June, 2013, when she retired at the age of 91. Rev. Mary Beth Ellis, longtime member of the Unity family, became the minister at that time, thus continuing the tradition of 89 years of female ministers at Unity of New Orleans.